M.C.A. 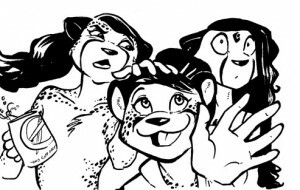 Hogarth is running a Kickstarter campaign to launch her new web comic The Three Jaguars, a comedic slice-of-life about the intersection of art and business. Prizes include cameos, product advertisements (drawn by the artist), original art and postcards. The Kickstarter is 263% funded, with a week to go. Prizes are limited.